Blissful Daily Moisturiser, Citrus Mint Shower Gel, Lavender Meadow Hand & Nail Cream, and 2-Minute Moisture Hair Mask. Having already tried 2 out of 4, this will be great to see that two of the products I've enjoyed and two others that I am yet to discover that other beauty bloggers have enjoyed. You can read where I use the Lavender Meadow Hand & Nail Cream and what I think of the Citrus Mint Shower Gel. 2-Minute Moisture Hair Mask, I've only tried this once to be honest, but upo application I noticed how soft to touch the texture of my hair was. Since reverting back to curly finding a nice balance of moisture and less frizz & dryness has been a learning curve, so it would be nice nice to see how this one over time helps my hair when in times of need compared to ones I have that do the same thing but at a higher cost. Blissful Daily Moisturiser is for normal / combination skin. 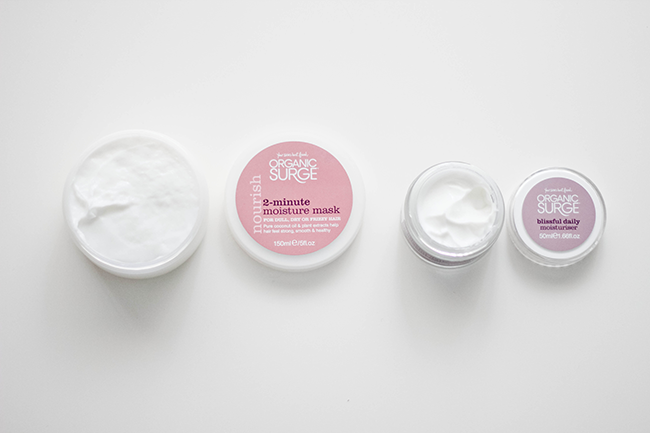 It's mix of natural hydrators, anti-oxidants and essential oils work to balance oily & dry skin. Sweet almond oil, aloe vera, glycerine, rosemary, lemon & sweet orange essential oils are the natural actives you will find it this moisturiser. The texture is very light and blends in well, doesn't leave the face feeling greasy to let you know it's moisturised. The bundle valued originally at £24.08 which is the same price as if you was to buy the products individually. They've currently got it on sale for £20.95. Save a few pounds and grab this as a treat for yourself or for an organic, cruelty free beauty enthusiast! What do you think of this bundle? Would you change any of the items for a favourite of yours?